If you are looking for the Best Raspberry Drink Recipes, made with healthy raspberries, here is a Large Collection of Non-Alcoholic and Alcoholic Drinks to make with these delectable fruits. Make one of these amazing beverages with raspberries, and give your taste buds, and those of your family and guests, a treat! Whether you are looking for recipe to make a healthy drink for a hot summer day, or a warm evening snack, go for a Raspberry Drink! Perhaps you need a fashionable, tasty, and showy cocktail for a party? 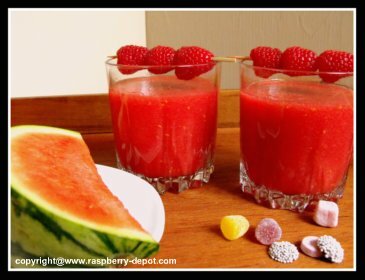 I have included some of these raspberry drink recipes as well. Most of these recipes are easy and quick to make, and are made with the basic equipment that, most likely, everyone has in their kitchen; for example, a blender. Keep in mind that it is important that you use only high-quality ingredients for all your homemade drink recipes. Not only will the drink taste better with high quality ingredients, but you could endanger your health if you use poor quality ingredients. This is especially true for alcoholic ingredients. Fresh raspberries are always the preferred ingredient, however, most often, you can substitute frozen raspberries (see How to Freeze Raspberries). Looking for Raspberry Punch, Smoothie or Juice Recipes? If you prefer, to save time and effort, you can purchase pre-made raspberry cocktail mixes, or ingredients for cocktail mixes. These (below) raspberry drink mixes, or cocktail ingredients can be purchased on-line from *Amazon.com, and, in most cases, be delivered right to your door! Click on the image for additional product information and customer product reviews. Most homemade beverage recipes require the use of a blender. I have used the same "Oster" Brand of blender for about 25 years, and it is still working "like a charm"! If you are looking for a new blender, or if you are looking for a gift for someone, I whole-heartedly recommend an "Oster" blender. Blenders are one of the handiest kitchen appliances, however I do find that they can be quite labour intensive to clean, especially when you are only using the blender to blend or purée a small quantity of food. The "magic bullet" however, is a sort of mini-blender in which you prepare the drinks right in the mug attachment! My daughter-in-law uses a "magic bullet" when preparing drinks and smoothies for herself and her husband, and she highly endorses this product. Here, below, are aids to assist in the creation of all types of drinks to make at home. Click on the images for additional product information and customer product reviews from *Amazon.com. Frost the rims of the glasses by brushing them with lemon juice and then dipping them in sugar. Let the rims dry until ready to serve. You can also use "salt" instead of sugar. You also have the option of purchasing specialty rim sugar online from *Amazon.com (see below).